The UAE has shown remarkable improvement in its innovation standing by rising six places on the Global Innovation Index 2017, which was launched by a UN agency in Geneva. The country ranks first among Arab nations and 35th worldwide in terms of overall performance on the index, up from 41st globally in 2016, according to the GII 2017 produced jointly by the World Intellectual Property Organisation (WIPO), Cornell University and Insead. The GII measured the performance of 128 countries and economies in the area of innovation, which represents the majority of the global workforce and global GDP. The index is based on 81 indicators, which measure innovation in detail and provide a clear understanding of how it drives economic growth and prosperity. Switzerland, Sweden, the Netherlands, the US and the UK are the world’s most-innovative countries, while a group of nations including India, Kenya, and Vietnam are outperforming their development-level peers. The report said the UAE benefits from increased data availability and shows strengths in tertiary inbound mobility, innovation clusters and ICT-driven business model innovation. This is due to the outstanding progress made by the UAE to its sustainable achievements in innovation inputs, especially the strengthening of institutions and market sophistication. The UAE has one of the best political and legislative environments in the world along with outstanding development in information technology, communications, infrastructure and innovation linkages. Innovation has become an integral part of the successful performance and competitiveness of the UAE, in terms of both public and private sector activities. This is seen in the launching of the National Strategy for Innovation in 2014, which was followed by the declaration of 2015 as ‘The Year of Innovation’ in the UAE. The GII sub-indices showed that the country ranked first globally in the cost of redundancy dismissal, salary weeks, ease of paying taxes and tertiary inbound mobility. Progress in innovation inputs also included a significant improvement in market sophistication thanks to growth in investment and credit. Investments have gone up from a rank of 55 to 33 thanks to market capitalisation that increased from a rank of 32 to 30 and venture capital deals that went up from 34 to 28. In the business sophistication indices, the R&D performed by business rose from 0.5 per cent of GDP to 0.9 per cent, while the R&D financed by business is ranked third in the world. Knowledge and technology outputs went up from 86 to 71. This dimension includes knowledge diffusion that has increased from 53 to 45, thanks among others to significant changes in FDI net outflows. Across the creativity outputs index, the country achieved a rise in the number of trademark registration applications at the national level from 11.3 to 11.4 per billion USD GDP. Each year, the GII surveys some 130 economies using dozens of metrics, from patent filings to education spending providing decision makers a high-level look at the innovative activity that increasingly drives economic and social growth. In a new feature for the GII, a special section looks at ‘invention hotspots’ around the globe that show the highest density of inventors listed in international patent applications. The GII 2017 notes a continued gap in innovative capacity between developed and developing nations and lackluster growth rates for research and development activities, both at the government and corporate levels. 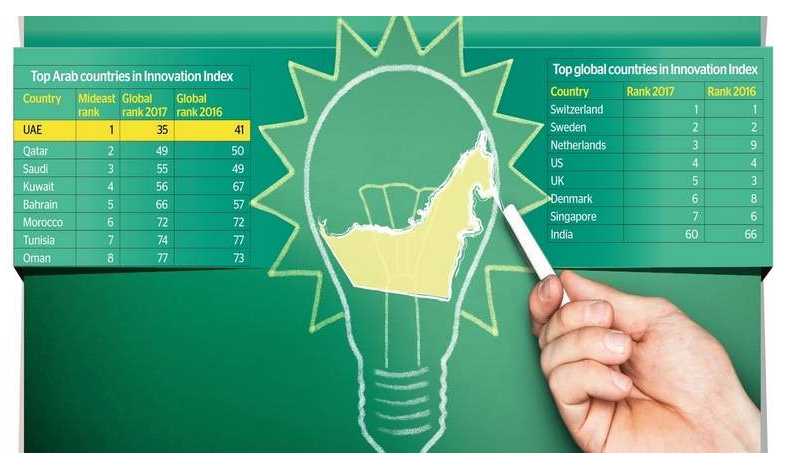 Emerging markets are climbing up the ranks of the world’s most innovative nations. India, 60th globally, is the top-ranked economy in Central and Southern Asia and has now outperformed on innovation relative to its GDP per capita for seven years in a row. India has shown improvement in most areas, including in infrastructure, business sophistication, knowledge and technology and creative outputs. India ranks 14th overall in the presence of global R&D companies, considerably better than comparable groups of lower- and upper-middle-income economies. India also surpasses most other middle-income economies in science and engineering graduates, gross capital formation, GERD performed by business, research talent, on the input side; quality of scientific publications, growth rate of GDP per worker, high-tech and ICT services exports, creative goods exports, high-tech manufactures, and IP receipts on the output side. “Public policy plays a pivotal role in creating an enabling environment conducive to innovation. In the last two years, we have seen important activities around the GII in India like the formation of India’s high-level Task Force on Innovation and consultative exercises on both innovation policy and better innovation metrics,” said Chandrajit Banerjee, director-general, Confederation of Indian Industry. The theme of the GII 2017, ‘Innovation Feeding the World’, looks at innovation carried out in agriculture and food systems. The survey showed China rose three spots to 22nd place on the list, far ahead of other developing countries. China’s weak spots included tertiary education, the regulatory environment, creative media and protection of minority investors. But in many areas, such as high-tech exports, industrial design and business sophistication, it punched far above its weight. “By 2050, the world’s population is estimated to reach 9.7 billion. This presents the global agricultural sector with a daunting challenge. The stage has been set for a potential global food crisis if policymakers and other stakeholders fail to implement agricultural innovation that significantly boosts productivity,” said Barry Jaruzelski, Principal at Strategy&, PwC’s strategy consulting business.